Palkia (left) faces off against Dialga (right) in a subspace dimension. Who will come out on top in this battle of the gods? Our tenth film, The Rise of Darkrai, known in Japan as 「ディアルガVSパルキアVSダークライ」(lit. “Dialga vs. Palkia vs. Darkrai”) premiered in Japanese theaters on July 14, 2007 and on Cartoon Network in the United States on February 24, 2008. This film marks the end of the Advanced Generation series of movies and debuts the Diamond and Pearl era. As mentioned in our previous review, Haruka (May) and Masato (Max) will not be travelling alongside of Satoshi (Ash Ketchum) and Takeshi (Brock) this time around. Instead, the two will be accompanied by Hikari (Dawn), a new protagonist whose value as a character we’ll discuss later. So this begs the question: how’s Dialga vs. Palkia vs. Darkrai (hereby Darkrai) serve as an introduction to a new series? Let’s take a look. In an alternate dimension, two giant Pokemon are fighting one another. Their battle scares the Unown residing in this dimension, causing them to scatter and flee. One is Dialga, a Pokemon that resides over all space. The other is Palkia, a Pokemon who watches over the flow of time. Dialga, believing that Palkia is intruding upon its territory, started attacking first. Equally matched, the two continue their struggle. Back in the real world, Satoshi, Takeshi, and Hikari are continuing their journey towards their next destination, Alamos Town. Besides hosting a Pokemon Contest, the town is famous for its Space-Time Tower. This structure not only acts as a timekeeping piece for the town, but has a second identity as the world’s largest functioning musical instrument. Inside the structure is a series of pendulums and bells that are tuned to notes. In Alamos Town, the trio meet Alice, a hot air balloon guide for Alamos Town. Through Alice, the trio also meet Tonio, a researcher whose great-grandfather Godey built the Space-Time Tower. Tonio’s research involves strange cross-dimensional energy spikes that are spilling into their dimension. Recently, they’ve been appearing more and more frequently and he’s searching for the cause. The five of them conclude their tour through Alamos Town in a beautiful botanical garden that Alice’s grandmother used to maintain. From her grandmother, Alice learned a special song that is able to soothe the hearts of Pokemon, known as Oración. Alice plays the song using a leaf whistle, attracting the Pokemon of the garden to her and the rest of the gang where they all spend some time to play. While playing with the Pokemon of the garden, they are joined by Baron Alberto, a wealthy individual who wishes to take Alice as his bride despite Alice’s constant refusal and assertion that Tonio is her love. While they are bickering, the gang are all attacked by a Pokemon that haunts the garden known as Darkrai. Darkrai is feared by the people of Alamos Town as it is known to cause horrible nightmares in the dreams of both people and Pokemon alike. Baron Alberto, seeing his chance to rid the town of the menace, sends out his trusted Lickilicky to fight the Pokemon. Darkrai proves to be much too strong for Alberto’s Lickilicky and is about to take it down with its signature Dark Void attack. Lickilicky dodges the attack however and the Dark Void hits Satoshi, putting him into a deep sleep. While sleeping, Satoshi has a nightmare in which he is attacked by the vague form of a large pink creature and also confronted by an illusion in which Pikachu is sinking into the ground. Satoshi jumps into the sinking pit to save Pikachu, but before the two are swallowed, he wakes up. He finds himself in a bed at the town’s Pokemon Center. While he’s been suffering through Darkrai’s nightmare, Darkrai was going around town putting people and Pokemon to sleep and inducing nightmares. Meanwhile, in the subspace dimension, Dialga and Palkia continue to fight. Their battle is what’s creating the cross-dimensional shockwaves Tonio’s been researching. During this particular exchange, Palkia’s left arm is wounded, forcing the Pokemon to flee by hopping across dimensions. Palkia’s destination of choice happened to be the world of our heroes. Its heading: Alamos Town. Darkrai’s nightmares in the meanstead are becoming even more serious as the nightmares of the people and Pokemon begin to manifest themselves in an eerie ethereal manner. Tonio suspects that this strange phenomenon is due to the strange cross-dimensional energy shockwaves. Baron Alberto, infuriated at Darkrai, decides to stand against Darkrai and defeat it once and for all and stop the nightmares. He organizes the trainers in the town to help him stop the menace and they all go to hunt it down. While the trainers of the town hunt down Darkrai, a large shockwave more powerful than any preceding it originates from above the Space-Time Tower. Upon close analysis, Tonio finds that Palkia made its way to Alamos Town. To make matters worse, Palkia’s appearance isolated the town from the rest of the world, trapping it inside of a sub-space bubble to recover from Dialga’s attack. Darkrai, sensing the appearance of Palkia, immediately goes on the offensive and attacks Palkia. Enraged, Palkia retaliates, shrugging off Darkrai’s comparatively pitiful attacks. Darkrai’s attacks however caused Palkia’s barrier to disappear, and alerted Dialga to Palkia’s present location. It’s then that Tonio and Satoshi realized that Darkrai’s nightmare inducing spree wasn’t due to any kind of malevolence, but rather it was sending a warning message to the Pokemon and trainers. The pink creature Satoshi saw in his nightmare was actually a warning about Palkia’s arrival, which Darkrai could sense. Dialga and Palkia resume their fight above Alamos Town, now entirely caught in the subspace dimension. The fight between these two godlike Pokemon slowly destroy the town and the citizens realize that without Palkia’s barrier, the subspace dimension is slowly eating away the town. Satoshi and the crew evacuate everyone to the botanical garden at the center of the town, while desperately thinking of a way to stop the fight between Dialga and Palkia. Tonio then recalls something he read in his great-grandfather’s notes about why he built the Space-Time Tower. 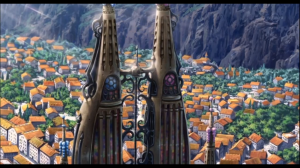 He did not build the tower as a mere decorative piece, but he foresaw in a nightmare the destruction of Alamos City in a fight between Dialga and Palkia. He created the tower such that the people of the town might have a way to pacify Dialga and Palkia. Realizing that his great-grandfather was talking about Alice’s grandmother’s song, Oración, Tonio, Alice, Satoshi, Takeshi, and Hikari all rush towards the Space-Time Tower to play the song for Dialga and Palkia. Angered at their selfish fighting and the destruction of his home, Darkrai interferes in the battle between Dialga and Palkia and serves to distract their fight whilst Satoshi and the others climb up the Space-Time Tower and prepare to play Oración. Unfortunately, Darkrai’s power was no match for the combined powers of Dialga and Palkia and he was swiftly defeated. However, Darkrai’s distraction was enough to buy Satoshi and Hikari, who were responsible for climbing up the tower to prepare Oración. Hearing the song ringing from the Space-Time Tower, Dialga and Palkia halt their battle once and for all. Dialga returns to its proper dimension as does Palkia, after returning a restored Alamos Town back to its original dimension. At the end of the film, our heroes find out that Darkrai, despite the damage it took, managed to survive through the battle and stands looking over Alamos Town as its protector. Before we begin, let me just say up front that I have MASSIVE bias against the fourth generation of Pokemon games. I earnestly felt that their ideas for Pokemon went way too far in this generation. When I said it in the little movie blurb, I wasn’t kidding. Dialga and Palkia are actually supposed to be the gods that reside over the realms of space and time. They are godly powerful primordial beings. And they can be shoved into tiny balls and listen to the beck and call of a mere human. It’s irritating. That aside, despite this being my least favorite generation of Pokemon, this Diamond and Pearl subseries ironically delivered the most consistently enjoyable set of movies. Diamond and Pearl concluded after 4 movies and, starting with Darkrai, the first three of these serve as a collective story trilogy. This marks the first time that any of the Pokemon films acknowledged any kind of real continuity along a progressing timeline. It’s almost as if the writers learned from their mistake with Manaphy and decided to allow an entire story they wished to tell span across 3 movies instead of trying to cram it into 1 with mediocre results. I’ll delve into the other two parts of this trilogy when it comes time to review their respective movies, but I’ll say that this trilogy as a whole delivers some of the most compelling storytelling since Mewtwo and Celebi. 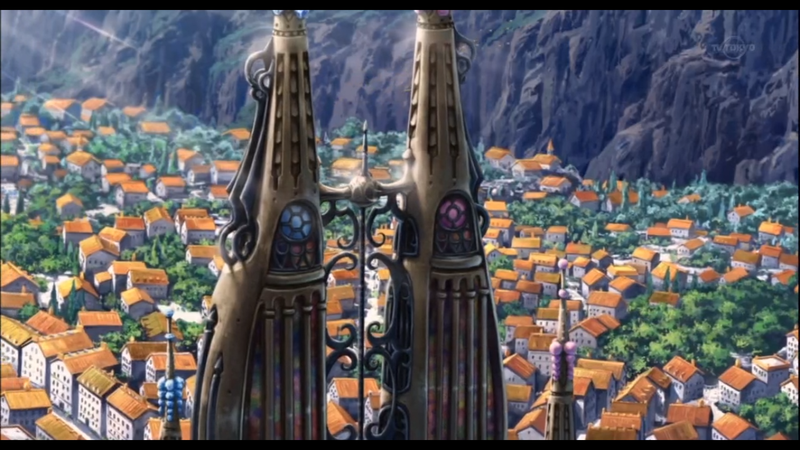 A panoramic sky-view of the Space-Time Tower and Alamos Town. This kind of detail is something we never would have imagined in a previous film. Now let’s talk Darkrai itself. I will say that since Mewtwo, this is the first time that a Pokemon movie has truly deserved its place as a cinematic experience. Visually, this is the first time since Mewtwo that I felt that the quality of the animation far and beyond surpassed what we see in the anime. Like Deoxys, Darkrai might only take place in a single town, but the scale and locales we see are so varied that it feels like so much more than just one location. 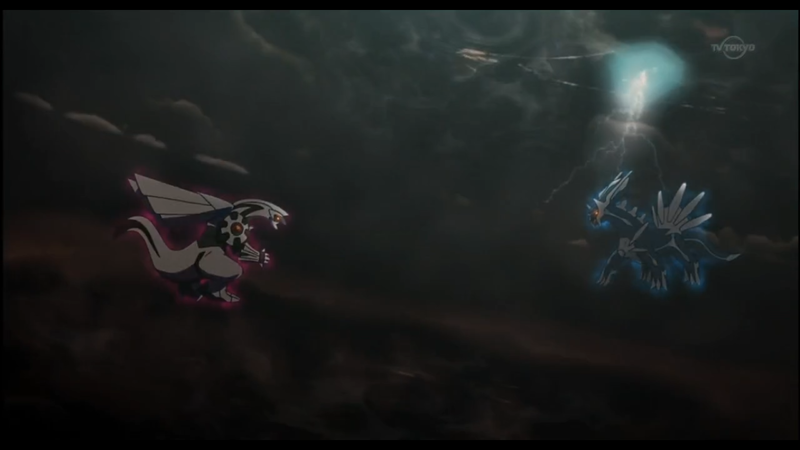 Scale is key here, as keeping the action to a confined space would make little sense considering that the titular Pokemon, Dialga and Palkia, are literally gods who are fighting with each other. The long-shots we see throughout the film remind us that this is, while strange, an appropriately sized arena for such large forces. From left to right, Alice, Tonio, Baron Alberto, Satoshi, Takeshi, and Hikari. 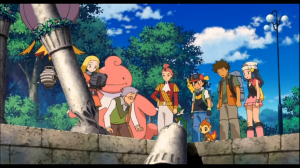 All of our protagonists gathered together in a single shot! If you’ve seen this movie yourself or read my plot synopsis up above, you’ll also note that despite how much of the excess I tried to cut, this movie’s plot is busy. Many simultaneous stories are running at the same time. Normally, this would detract a lot from how easy the plot is to understand, but Darkrai manages to keep all the parallel stories in check and explains them in the right amount of detail to keep you hooked. The love triangle between Tonio, Alice, and Alberto, the story behind the Space-Time Tower and Oración, Darkrai’s backstory, and the fight between Dialga and Palkia are all running alongside one another. Never once did I feel any of the stories fall behind or take too much of a backseat. More importantly, unlike in other films, I never once felt like a character had no place in the story. While some ended up doing more than others, every character had a distinct role which they filled perfectly. Speaking of characters, let’s talk about Hikari. How does the newbie hold up to her predecessors? Well, let’s just say she blows them out of the water. For once, the writers didn’t shove all the heroism onto Satoshi. Besides being effective with her Pokemon in battle, Hikari pulled her weight helping Satoshi activate the Space-Time Tower to play Oración. And this was without her falling behind as a sideline cheerleader nor being shoehorned into a lead role by the will of the writers. She’s a natural character whose actions and personality seem far more natural and three-dimensional that that of Kasumi (Misty) or Haruka and Masato. Heck, she did more in this movie than Takeshi did in the entire Advanced Generation series! Impressive! We’ll be seeing more from her in upcoming films. The enigmatic Darkrai as it shrugs off a powerful attack from an Alamos Town Pokemon trainer. Title Pokemon Darkrai had the makings of a problematic element to the film, but I ended up liking how he was used. At first, it feels like he’s shoehorned into the movie. Though his role in the plot is a little bit improbable, I still feel he strengthens the connection to the film. He’s a bit out of place compared to the god Pokemon he shares the title with, but Darkrai’s story is where we are given the movie’s most human element: The consideration of how strong the bonds develop between Pokemon and trainers. Alice’s grandmother was the first human to accept Darkrai despite its unfortunate power to bring nightmares upon people, and since then it has wanted nothing but to protect its new home as well as the people of Alamos Town. In the main story, Darkrai is the classic misunderstood hero who is antagonized by the main characters and townsfolk, but saves them in the end. 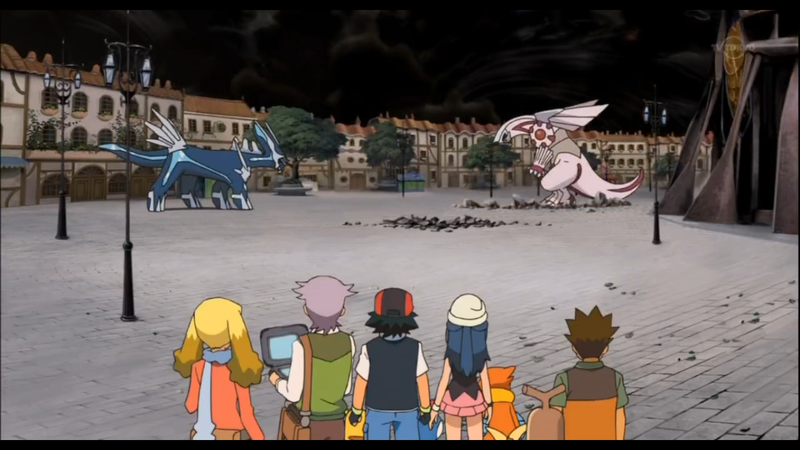 Dialga and Palkia face off once again in the Alamos Town square. The black skies and ruined streets add tension, don’t they? Darkrai also proves critical in establishing a power hierarchy between Dialga, Palkia, and the rest of the Pokemon in this universe. 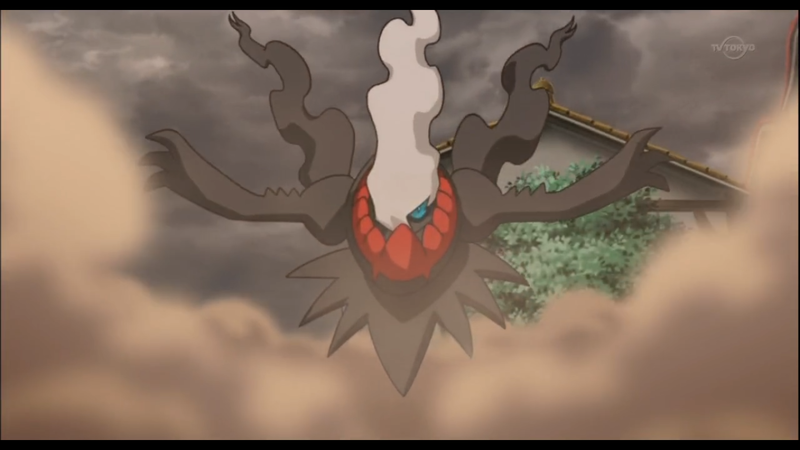 Darkrai is powerful enough to take on multiple Pokemon from talented trainers all at the same time early in the film, but proved to be powerless against Dialga and Palkia, who shrugged off all of Darkrai’s attacks while Darkrai had to expend all his energy to defend against theirs. It isn’t obvious after just one film, but creating this frame of reference for how powerful these god Pokemon are will come into play later in this trilogy. The writers did an impressive job sneaking that in here without shoving it down our throats. To tell you the truth, there really isn’t much I have to complain about Darkrai as a film. If I had to pick anything, it’s that Dialga and Palkia’s conflict was stopped by a deus ex machina device in the form of the Space-Time Tower and the song Oración. However, even that is not particularly offensive because of how well the movie paves the way for this solution. Oración is shown at least three times throughout the movie to have a soothing effect on Pokemon’s souls. To put another way, Oración made considerably more sense than the mysterious ray of light that Satoshi used previous in Manaphy, one of the biggest cop-outs in any of the Pokemon films. Not this time. Though it sounds silly, the role of the Oración in resolving the conflict works very well. As the pace-setter for the Diamond and Pearl series, Darkrai hits the ground running. It far surpassed my expectations after all the disappointing films in the Advanced Generation series and sets a promising tone for future films. Next time, we’ll take a look at the middle entry in this trilogy of films, Giratina and the Sky’s Boquet – Shaymin.